The house where I grew up had heavy wood-frame storm windows that my dad would dutifully remove every spring, repair as required, and reinstall in October. He’d tie a big rope around his waist in case he lost his balance and hoist the windows up a tall ladder. It was a huge job but well worth the effort since it helped to keep the drafts out, and the heat in, through our long winters. Air-sealing is just plugging the leaks with caulking and weather stripping. Feel for leaks along window frames and trim, doors, exhaust vents, mail slots, basement sills and headers, your electrical service entry, floor drains, foundation cracks and electrical outlets. Check your chimney for cracks. Caulk baseboards top and bottom, on inside walls as well as outside walls. Replace worn weather-stripping. Put child-safety plugs in empty wall sockets. To improve insulation, start in the area with the least amount of insulation. Insulate your basement walls, sills and headers. Insulate your light switches and power outlets with foam gaskets designed to fit neatly behind the cover plates. If you have a fireplace, outfit it with an insert. This can become an eco-friendly source of heat but also make your fireplace airtight so heat doesn’t go up the chimney and cold air doesn’t come down into your home. Keep your heating system in top form so it’s operating as efficiently as possible. As part of the maintenance you can have the efficiency checked. Consider replacing your furnace if it’s old or no longer running efficiently. Have your furnace cleaned annually and clean the filters monthly during heating season. For more information on how to reduce your heating costs and keep your home warmer consider booking an Energy Evaluation through NB Power. It costs $210 but will provide you with a plan for making your home more efficient. If you live in an electrically heated home, you’re eligible for incentives through the Home Insulation Energy Savings Program. (Homeowners who do one major insulation upgrade through the Home Insulation Energy Savings Program will be eligible for a $500 heat pump bonus.) 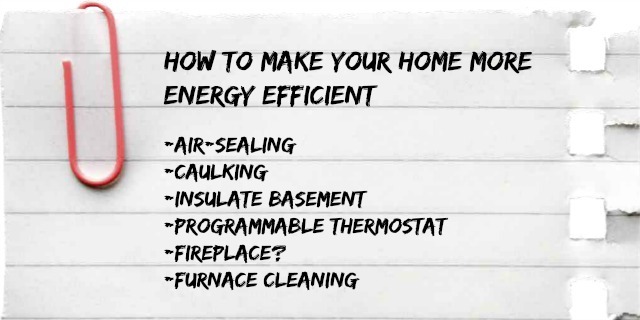 For do-it-yourself tips and suggestions for air-sealing and insulating your home visit to nbpower.com “Smart Habits” page.